As the clock ticks down to the arrival of summer, now is a good time to consider the safety of your swimming pool. Did you know that drowning is the most common cause of unintentional death for young children between the ages of one and four? Research also shows that these kids commonly drown in swimming pools. As much as we would like to believe otherwise, accidents can and do happen. 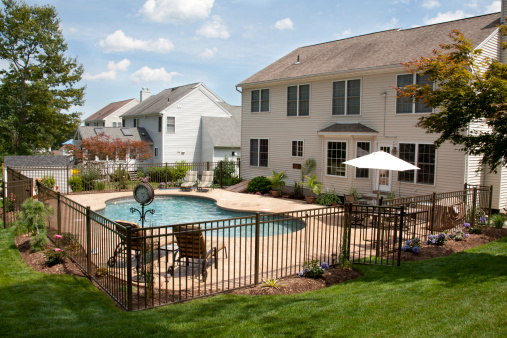 Installing a fence along the perimeter of your pool can prevent children and animals from having unsupervised access to it, while still ensuring it’s aesthetically pleasing. Regardless of whether you want to do the installation yourself, or hire a fence contractor, here are a few things to keep in mind to make smart, safe decisions. Some city by-laws require pools to have fence enclosures installed at a specific minimum height. For instance, Toronto requires swimming pool enclosures to be a minimum of 1.2 metres or higher depending on the type of property or material used. Other possible requirements can include observing ground clearance levels and adhering to restrictions on the maximum size of openings in fencing material. Make sure your fence installation is compliant with all appropriate permits and requirements. If you are using a fencing contractor, they should be able to take care of many of these elements for you. A chain link fence is not the best idea for an enclosure around a pool. Regardless of its height, a chain link fence can be scaled by a sufficiently determined kid. Vertical bars, glass, or wood panel fencing not only look better, but they are also much harder to bypass. Your swimming pool fence should have a secure gate that is weighed to swing closed and latch automatically. Add childproof latches for added security. Gates without a top crossbar are the safest choice since they won’t provide a secure grip for children who want to climb them. You may not want to keep your safety fence up year-round. If this is the case, then consider removable mesh fencing. While it’s not the best-looking material, it will provide an easy-to-move barrier that can be put away when summer is over. Temporary fences are secured in holes that are drilled into the deck. They can be capped once the fence has been put into storage. Remember to test the fence posts after every installation to ensure they are secured correctly. These tips aren’t strictly related to fencing choices, but they are worth keeping in mind when you are choosing your pool’s safety fence. First, make sure that your fenced-in section encompasses only the pool area. If the only reason to go through the fence is to use the pool, then there is a lower risk of an accident occurring. Second, no matter how well-behaved or obedient your children are, assume that they will try to beat your safety fence. This doesn’t mean you need to be paranoid, but you should accept the fact that kids love pools and they don’t always recognize the risks involved with swimming while unsupervised. As a result, it’s best to ensure your fence is sturdy and not easily climbable. Total Fence Inc. is one of the leading fence installation contractors in the Greater Toronto Area. Our experts can walk you through different swimming pool fencing options to help you make safe choices for your family. Contact us at 416-239-5362 to speak with a consultant and learn the best way to secure your pool for the summer. “Web-based Injury Statistics Query and Reporting System (WISQARS),” Centers for Disease Control and Prevention web site, April 1, 2015; http://www.cdc.gov/injury/wisqars. “Fence Standards, ” City of Toronto web site; http://www1.toronto.ca/wps/portal/contentonly?